I am so thankful to have these little guys home. Knowing that there are parents in Newtown whose precious babies will never be returning home is almost more than anyone can bear. In the wake of senseless tragedies like the one on Friday morning our senses become heightened. We tend to live more in the moment. And for a while we slow down a bit to hear our little ones voices as they yell, "Mommy!". What a privilege it is to hear that word! Don't ever take it for granted. Hug and love on your little ones because we are never promised tomorrow. Praying for all of you affected by the Sandy Hook shooting. Here's a great blog post on the tragedy written by Jen Wilkin. Beautiful picture. Your boys look adorable in their little red outfits. Adorable photo of your boys by the Christmas tree. So adorable. 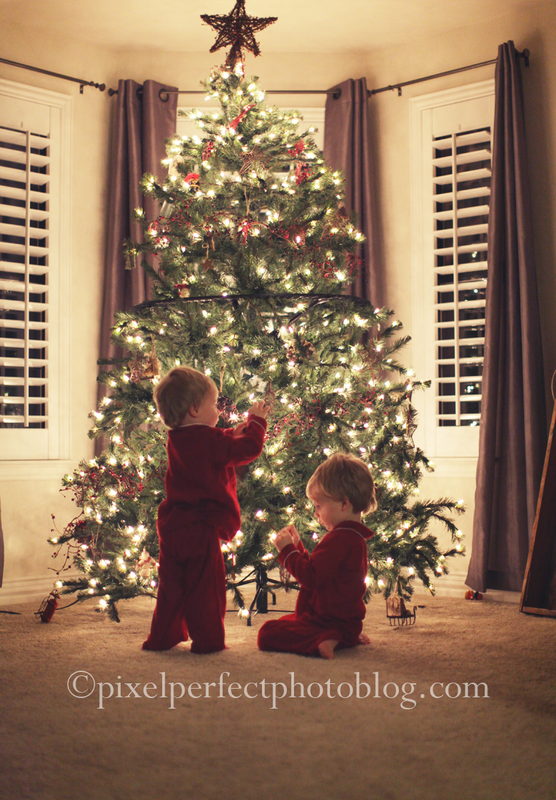 We did a Christmas tree photo of our two every year by the tree, alot of times in pjs. When Justin got married, then I got he and his wife,Erin,and with Megan,his sister. Love it. Yes, we grieve and pray for those who have lost children this holiday season. So sad. Hugs to you all! Merry Christmas! I love what you said in this post.